Olympus Labs Test1fy is an updated form of the most revolutionary natural testosterone booster on the market. See the new capsule-based Test1fy here! Olympus Labs Ep1logue is a natural muscle building supplement with the largest dose of epicatechin we've ever seen.. but wait until you see the STACK! Olympus Labs Massacr3 was launched in 2017 with the largest-ever laxogenin dose we've ever seen, but also introduced urolithin B to the market! The ULTIMATE Highest Dosed Multifaceted Laxogenin Supplement! Massacr3 Now With Laxo, Vaso6, And UroBolin! In the world of bodybuilding, being big and strong is a common aspiration. The quest to develop a god-like physique often leads many to the use of banned substances, despite the potential health risks. Fortunately, there is an alternate route to the big, lean and sculpted body you covet…that is completely natural. Unsurprisingly, it is the DemiGod crew who can set you on the path to success. Employing the brightest minds in the business to bring you the most innovative and effective supplements worthy of your money. Our latest offering is no different, a product geared towards building lean mass. A product that will spark a MASSACR3 everytime you enter the gym! MASSACR3 is the counterpart to EP1LOGUE. Both products are anchored by the same core formula; 300mg of VASO-6 and 150mg of Urolithin B. VASO-6 is an innovative ingredient which we dubbed “Super Epicatechin”. It was first studied and funded through the University of South Florida and it significantly increases vasodilation, stimulates blood flow and activates muscle hypertrophy. Urolithin B is another innovative ingredient that Olympus Labs brought to the market. Research has shown it can inhibit protein catabolism and simultaneously increase protein synthesis. Urolithin B is remarkable compound, a natural ingredient that helps to build lean muscle while preventing muscle breakdown. With the launch of EP1LOGUE, the efficacy of VASO-6 and Urolithin B were validated. VASO-6, also used in RE1GN, has certainly lived up to the hype. The vascularity is perhaps the most noticeable aspect, but anecdotal feedback indicates increases in muscle mass with extended use. Conversely, Urolithin B emerged in EP1LOGUE with less hype but has quickly stolen the spotlight. It is truly the holy grail of natural supplements as predicted by the DemiGod R&D team. Are you actually surprised? The difference between EP1LOGUE and MASSACR3 is the latter contains 300mg of PhytoFUSETM 5-alpha-Hydroxy Laxogenin instead of PhytoFUSETM Epicatechin. Laxogenin can stimulate protein synthesis and inhibit protein degradation leading to increased lean mass. Therefore, MASSACR3 is intended for bulking or re-comp cycles whereas EP1LOGUE is better suited for re-comp or cutting cycles. MASSACR3 will deliver the same skin bursting pumps as EP1LOGUE but even greater increases in muscle mass. Since MASSACR3 is geared towards bulking cycles, the incremental calories from your diet should provide sufficient energy to sustain a high intensity throughout your workout. Afterall, DemiGods always train at a high intensity! 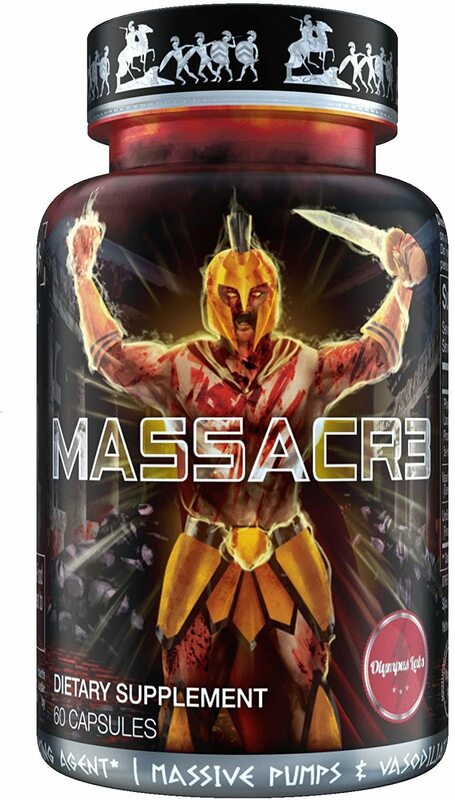 Prepare to transcend from a mere mortal to a DemiGod and MASSACR3 the competition every time you enter the gym! 5-alpha-Hydroxy Laxogenin is a sapogenin isolated from Smilax sieboldi, a plant-derived polyhydroxylated derivatives of 5a-cholestane. It can be found in small quantities in plants and foods such as pollen, seeds, and leaves. At the cellular level, it signals through a cell surface receptor kinase-mediated signal transduction pathway instead of through the nuclear receptor family of transcription factors. They have a wide array of physiological and effects in animals and insects including modulation of protein synthesis and carbohydrate metabolism. Research in animals suggest that plant-derived polyhydroxylated derivatives of 5a-cholestane can stimulate protein synthesis and inhibit protein degradation in part by inducing Akt phosphorylation. Akt is a serine/threonine kinase that signals downstream of growth factor receptors and phosphoinositide-3 kinase PI3K. Akt stimulates glucose uptake, glycogen synthesis, and protein synthesis via Akt/mTOR and Akt/GSK-3ß signaling networks and inhibits apoptosis and protein degradation in skeletal muscle by inactivating FoxO transcription factors leading to increased lean mass. Unfortunately there is a lack of research and trials on 5a-Hydroxy Laxogenin itself which is why several companies make product claims for Laxogenin based on compounds with similar molecular structure. Although Olympus Labs never made products claims for our Laxogenin products, STR3NGTH and STR3NGTH UNLEASHED based on that premise. We did however determine through experience that the ingredient required a suitable delivery system to mitigate its poor bioavailability. We were able to induce superioir rsults to competition by pairing Laxogenin with the proven PhytoFUSETM technology. Olympus Labs utilizes a unique delivery technology, PhytoFUSETM, to enhance the bioavailability and absorption of 5a-Hydroxy Laxogenin. Research has shown that this method of delivery can enhance potency anywhere from 2x-6x! That means that MASSACR3 will be 200 – 600% more potent than any other Laxogenin product on the market! This enhanced delivery system, unique to Olympus Labs, utilizes specific lipids to complex with Laxogenin on a molecular level, allowing for greater solubility and enhanced bioavailability/absorption, helping to effectively shuttle the active ingredient to the intestines where it can be taken up while preventing degradation throughout the process. This means that more ingredient is delivered to the site where it can be utilized effectively, ready to be delivered to the bloodstream and flood your muscles with potent myogenic factors needed to transcend into becoming a demigod! Vaso6 is a gallate-enhanced oligomer made up of dimers, trimers, tetramers and pentamers that is a powerful stimulator of nitric oxide production. It can be derived from the extracts of grape seed or green tea. Research has shown that extracts of grape seeds (GSE) causes endothelium dependent relaxation (EDR) activity in vitro. EDR activity involves the release of endothelial nitric oxide (NO) release and subsequent increase in cyclic guanosine monophosphate (GMP) levels in the vascular smooth muscle cells ultimately increasing vasodilation and blood flow. So why not just use grape seed extract which is inexpensive and widely available? Because Vaso6 only contains the components of GSE that are EDR active, meaning it only contains the components that will improve blood flow. Epicatechin-(4-8)-Epicatechin-(4-8)-Epicatechin-Gallate, hence the reason we refer to it as Superior Epicatechin. Vaso6 contains only the peaks and fractions of GSE with the highest EDR activity including peak G6, hence the name Vaso6. Furthermore, the gallate-enhanced catechins in Vaso6 activate the enzyme eNOS to produce NO. The enhancement of blood flow caused by Vaso6 improves the shuttling of glucose, insulin and other nutrients to metabolic targets. Glucose and nutrient uptake is a critical step to activating muscle protein synthesis. Therefore, you want the extreme vasodilation that Vaso6 provides prior to your workout. Furthermore, Nitric Oxide mediates muscle hypertrophy. Upon mechanical loading, NO reacts with superoxide to generate peroxynitrite. The latter then activates the TRPV1 (transient receptor potential cation channel subfamily V member 1) channel, causing an increase in intracellular Ca2+ levels via release from the sarcoplasmatic reticulum. Such elevation causes an increase in protein synthesis through TORC1 activation. Recent studies demonstrate that NO-synthase participates in the regulation of protein and energy metabolism in skeletal muscle by fine-tuning and stabilizing complex signaling systems which regulate protein synthesis and degradation. NOS activation during muscle stretching or resisting exercise initiates proliferation of G0-satellite cells. Released NO passes through the sarcolemma, and activates hepatocyte growth factor (HGF) through the activity of matrix metalloproteinases. Activated HGF interacts with c-met receptors of satellite cells, promoting their entrance into the cell cycle. Therefore, during resistance exercises NO works as an activator and as a regulator of signaling, and as a trigger of muscle hypertrophy. The end result is a functional pump! To summarize, Vaso6 enhances exercise capacity and endurance. It also increases vasodilation and blood flow which ultimately improves the shuttling of glucose, insulin and other nutrients to your muscles. The end result is the activation of muscle protein synthesis. In short, better performance and bigger muscles. Urolithin B is one of four metabolites of ellagic acid or ellagitannins. The first product of ellagic acid catabolism is urolithin D, and with the successive losses of hydroxy groups urolithins C, A, and B are formed. All mammals seem able to produce urolithins from the microflora in the gastrointestinal tract after the ingestion of some fruits. In healthy humans, urolithins A and B are most abundant. Research has shown supplementing the diet with ellagitannins mitigates muscle damage experienced during intense exercise and protects muscle against stresses induced by a high-fat diet. However, since ellagitannins are known to have low bioavailability, it is believed that ellagitannin-derived metabolites are responsible for the reported effects. Therefore, the focus of research has focused on characterizing the effects of urolithins themselves. Through that effort it was observed that myotubes in culture were bigger after incubation with Urolithin B. What this really means is that Urolithin B holds tremendous promise to increase skeletal muscle mass. Research on Urolithin B in mice found that it enhanced myotubes growth and differentiation by increasing protein synthesis. It demonstrated an ability to inhibit the ubiquitin–proteasome pathway (UPP), the principal mechanism for protein catabolism. It also induced muscle hypertrophy and reduced muscle atrophy. Signalling analyses indicate a connection between the androgen receptor and the mTORC1 pathway, possibly via AMPK. Olympus Labs is extremely excited to bring this powerful compound to the market. It is the crown jewel of the formula and the ultimate catalyst in the quest RE!GN supreme! MASSACR3 is a perfect example of the Olympus Labs mantra; Innovation, Value and Results, being executed flawlessly. A supplement that is quite different than anything available on the market because Olympus Labs prior uses the consumer over profit. So stop wasting your time and money on ineffective muscle builders or mass gainers. MASSACR3 will deliver real results that you didn’t think was possible. MASSACR3 increases blood flow and vascularity, induces muscle hypertrophy, stimulates protein synthesis and reduces muscle atrophy. In short, MASSACR3 does exactly what you want when bulking; promotes gains in muscle mass and reducing muscle breakdown. Every ingredient in MASSACR3 individually increases muscle mass but works synergistically to deliver exceptional results. The type of results that will allow you to MASSACR3 every workout!